A shorter list than the previous “A” list, the popular games in this list have to be Bang, Battlestar Galactica, Bohnanza and my personal fave of the list BRASS. For those with poor memory, you might want to take a look at Busen Memo. Hehe. My copy of Bang! – including all the expansions – is the 3rd edition (ie the small box packaging – pictured above – that sells for Rm50 only) but there’s no extras in the packaging. Just a deck of cards for up to 7 people to enjoy this lovely Western theme card game of bluff and player interaction. I remembered the first few times we played this back @ Games Circle, we did like 10 sessions in one-go! Yes it’s that addictive! This is how the cards in the 3rd edition of Bang! (above) looks like. And the 3rd edition of Bang! Dodge City (above). The current version of Bang! is a repackaged 4th edition (above), in a bigger gamebox, comes with a board (ala Lost Cities), some bullet/wound tokens and a player mat for each person. The cards were also redrawn to fit the new “look”. 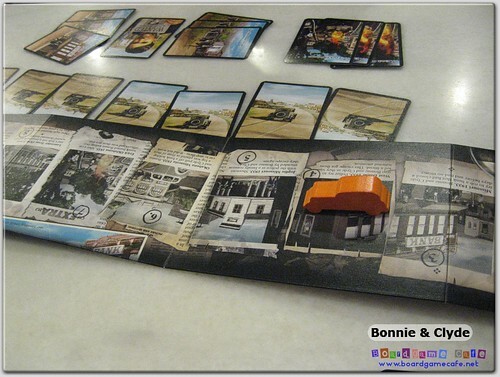 The cards and components of the 4th edition of Bang!. There’s also a corresponding 4th edition packaging for the Dodge City expansion. However the Fistful of Cards expansion did not undergo a 4th edition printing as it’s already out of print. The only way to get a copy of this expansion is to buy Bang! The Bullet (see next game item). Hmm…. nxKiller appears to come straight out from one of the spaghetti western movie? 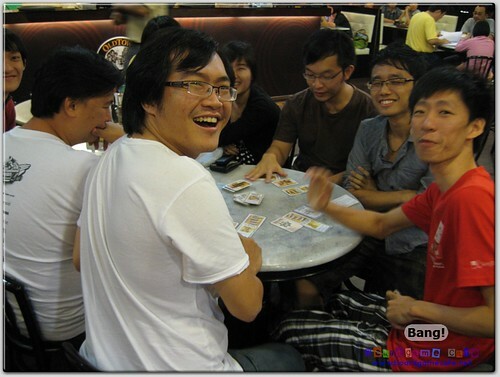 Caleb’s group early forays into boardgaming started with BANG! as well. Somehow we dun seem to get this played often at OTK Cheras. 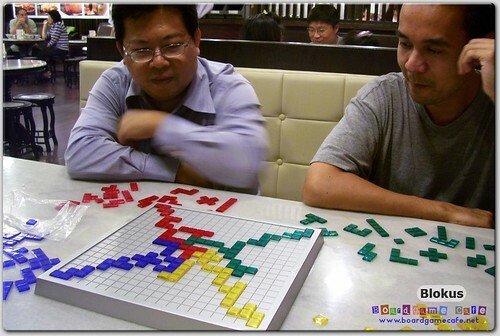 Could be the open café environment does not facilitate this type of game. Hopefully we’ll get to see more BANG! on the tables at the new OTK. The people at DVG (publisher for Bang!) having seen how popular Bang! has become decided to come up with a deluxe version. Calling it Bang! The Bullet, they packaged it in a nice bullet casing and beside offering the base game BANG!, the package includes all the expansions such as Dodge City, High Noon and A Fistful of Cards; and one nice shiny Sheriff’s badge. However note that while the base Bang! is the 4th edition version, there’s no player mats or bullet tokens included (can’t fit into the bullet casing) and the expansions are 3rd edition (Dodge City) or 2nd edition (rest). But if Bang! is your favorite game then the Bullet is a real value-for-money buy! 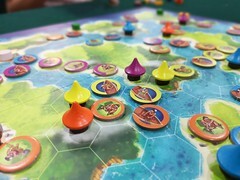 “B” appears to be the 2-player list with the 2nd two-player game appearing in this list in BATTLE LINE, a strange partnership between Knizia and GMT. Battle Line originated from the game Schotten-Totten which has cuter graphics but I guess GMT preferred the Hellenistic Era when they reprinted this game. GMT have also added Tactic Cards to Battle Line (whereas original Schotten does not use Tactic Cards though the new reprint of Schotten has included Tactic Cards as a variant) and there have been much debate about whether the game is better or otherwise with the Tactic Cards. 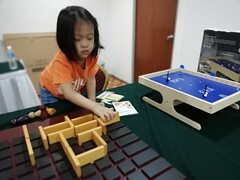 The Pudu Gamers, alanwsl and jacquesaw prefer the original Schotten-Totten which is without the Tactic cards (they used to play a lot of online Schotten) but I personally prefers Battle Line with the use of Tactic Cards as that adds some tension and uncertainty to your decision during the game. Apparently I was confused. I knew I’d the game Battle of the Bulge but I confused that with the Axis & Allies version. So no, I do not have the A&A Battle of the Bulge but instead I’ve the Avalon-Hill Smithsonian edition of the game with the same name (see game box above) instead. There are three editions to this game (before AH became Hasbro). Mine is the 1991 Smithsonian Edition but I actually preferred the box cover art of the 2nd edition (above). Most of FFG’s games tend to be chrome-heavy. Dun get me wrong here. I know most gamers love the extra chrome that FFG has added to their games but in most cases, they dun add much to the gameplay. However every now and then they do get a game right, and Battlestar Galactica (BSG) is one such success. Regardless of whether you’ve watched or followed the TV series of the same name (the 2004-reimagined version and not the original 1978 version), if you like games of deduction, intrigue, deception and player interaction; if games like Bang!, Shadows over Camelot, and Ghost Stories appeal to you, then you need to check out Battlestar Galactica – unless sci-fi is not really your cup of tea. 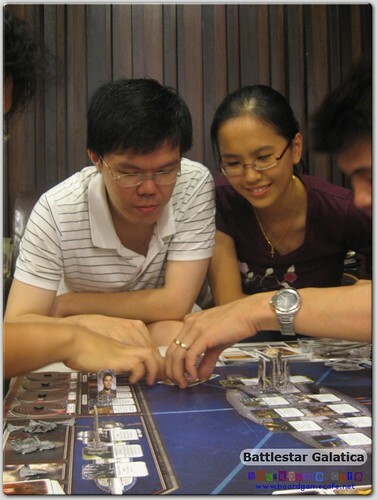 This game delivers an immersive gaming experience – as a group of six work, you and five others must work together to bring Galactica – and the accompanying passenger ships – to Earth while trying to flush out the identity of the two hidden Cylons in your midst – and evading the pursuing Cylon fleets (implemented via Crisis card events). Problem is, the two Cylons may not even know they are Cylons at the beginning! Rarely has a boardgame integrate so seamlessly a theme especially one from a successful TV series (most TV series tie-ins have pasted on theme) but I felt in BSG, FFG has delivered almost the “perfect” cooperative/traitor game. In all the games we’ve played so far @ OTK, the session’s always tense right until the end. The first expansion PEGASUS apparently adds elements to balance the game to the Humans favor. The battlestar Pegasus is powerful, and she can even absorb damages otherwise meant for Galactica. Hmm… does this mean Humans in general have a poorer win ratio against the Cylons? 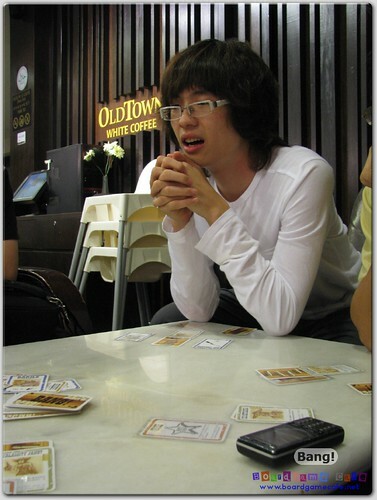 At OTK Cheras, it certainly appears to be so coz at one time, we were at an absymal record of loses against the Cylons. 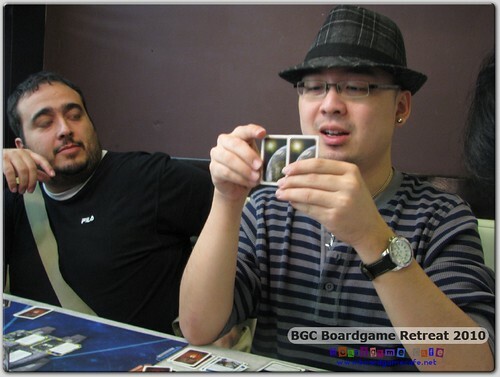 This was remedied somewhat when Commander Helena “Ken” (below) led the OTK Humans to their first victory over the toasters in our 2010 BGC Boardgame Retreat (Genting). We certainly like most aspects of the Pegasus expansion but didn’t find much to like in the Caprica module which remained unplayed up till now. The latest EXODUS expansion seems more like an enigma. It appears interesting but as yet, have not yet seen open play at OTK. On the other hand, this could be due to BSG sessions have also waned at OTK recently with some of the newer arrivals taking up play-time. When BSG rotates back to the tables, I am sure keen to get Exodus in for a run! A long OOP game from Avalon-Hill that’s reprinted recently by Hasbro. The 2nd print looks a whole lot better than the earlier AH edition. Gameplay wise I’ve no idea if it’s better but they have certainly fixed some of the rules erratas and included FAQS. However some gamers in BGG has commented they preferred the 1st Ed to this. This game should be on the menu for our upcoming Halloween Game Night, so stay tuned here for a sessrep from us. This game was an impulse buy many years back when I saw it on the shelves of Metrojaya. We did have many hilarious sessions with this game (Pudu Gamers) and it’s only much later than I knew this was a reprinted version of another popular party game PIT. You can’t go wrong with a game like this. Plays fast and it’s just fun! If you like this and can’t find it, try out Halli Galli and Jungle Speed as they have similar elements. Three-min to learn and a lifetime to play. That’s the tagline for Blokus. 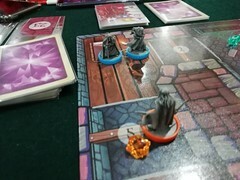 It really is fast to learn how to play this game, and with each session lasting no more than 30 min, it’s a good light game to bring out when the crowd prefers light party games. It’s an abstract game (so do not expect any theme to it) but it’s fun to play. It has another variant, using triangular perspective than rectangles and it’s called the Blokus Trigon. They also have a Travel version, a 3D version and a Junior version (for children) if you are so inclined to complete your Blokus collection! A game that resembles RISK, but added an economic engine (ie unlike RISK where there’s no maintenance on your troops, here you need to build an income engine to generate revenue for you to grow your influence & power) and wraps them under the Mafia/Gangster theme, and you get Blood Feud in New York. It’s very RISK-like in how you move your thugs to claim territories, invade others and fight (using dice). You do get options of limos, speedboats and helicopters for better mobility. And some of its mechanics like being able to use a limo to ferry a hitman deep into competitor’s territory to gun down his family boss reminds me of Samurai Swords (another game recently reprinted as Ikusa). The size of this game box – large Ti3 size – is probably what makes me lazy to carry it to (old) OTK Cheras to play. Maybe it’s time to revive this classic at the new OTK. In an era long before AGRICOLA defines “farming”, gamers were doing bean farming instead. From the same guy who gave us the ever-lovable AGRICOLA (and the brain-burning LE HAVRE), you wouldn’t have guessed his first successful game was a simple modest card game called BOHNANZA. Featuring cute graphics of various beans, this game is very good when you have the right type of crowd. In that sense, it’s similar to games like Werewolves, Bang! 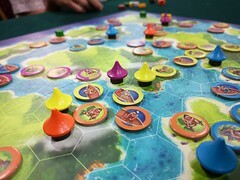 and Traders of Genoa where the right group can bring the game to a whole new level of fun! I’ve also had not-so-positive feedback from groups who are just not into this type of games. Hehe. The latest instalment of the Mystery Rummy series, this was produced by Rio Grande (while the first four in the series were US Game System products). Most Mystery Rummy games are best with 2, however this title appears to be one that’s really designed for four. So if you like “rummy” card games but is looking for one that can play more than 2, take a look at this game. 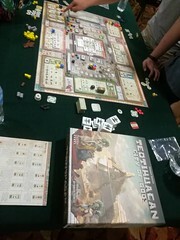 Another light card game, this one incorporates element of bidding and Settlers-like die-roll production in a game where players go gold prospecting in Boom Town! Has an interesting bidding mechanic where the bid money is re-distributed back to all the players. In this game, money is the victory objective so you need to watch where your bid money ends up with. Martin Wallace has since re-implemented this as Age of Industry (AOI) but I prefer BRASS to AOI. 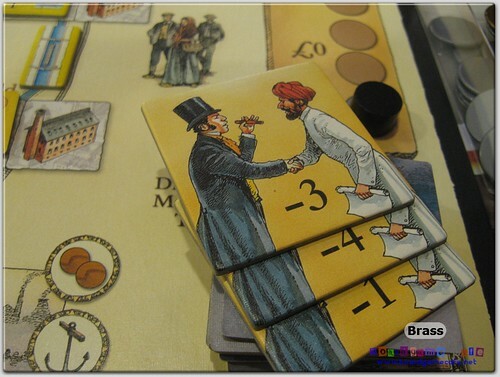 The rules of BRASS are fiddly in some ways like Power Grid but most of it are pretty thematic. I like the more varied supply & demand market in BRASS and how coal and iron differs in their rate of returns. Building tech in BRASS is better and does offer different paths to victory (as coal is different from iron in BRASS). In AOI, I struggled to find the difference in coal or iron since their returns appear to be similar. Most importantly, in AOI you draw one-time income per sale. In Brass you can build up your income level as revenue is recurring. The aspect of Age of Industry I like very much is the flexibility to support (future) expansion maps which is sorely lacking in Brass. 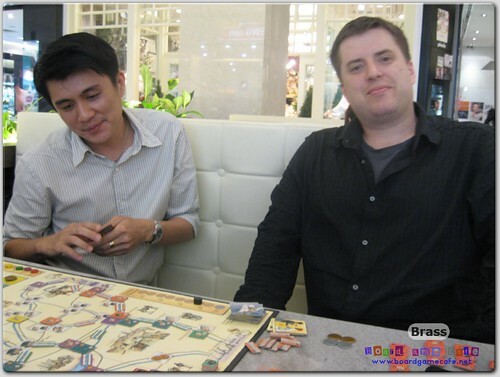 For more details on Brass vs AOI, refer to my sessrep on Age of Industry after our 1st play @ OTK in June last year. The external market in BRASS which allows you to make quick profit off an early industry but can get depleted very fast. It’s a cutthroat first-come-first-served basis here. BRASS plays well with 3- or 4-players. Not so with 2-player out of the box. There’s a recommended variant from the Geek and if you are keen to find out how BRASS works as a 2-player game, check out this review/report from Hiew on his attempt at 2-player Brass using the variant rules. More old school hex-based stuff here. This is a rather recent purchase after having stumbled upon an Australian wanting to sell off his unpunched copy of the original Avalon-Hill Breakout Normandy (BKN). Unpunched? And for a very reasonable price? You don’t find this type of deal every day. I went for the deal even though I’m aware L2 Design is reprinting this game (similar to how I bought a copy of 1830 – unpunched – when it became available in eBay even though Mayfair has already confirmed a reprint). Reprints can go either way; it can improve the original game (eg El Grande, Fury of Dracula, Space Hulk) or it can pull it down the sewers (eg Acquire & Diplomacy 50th Anniversary). Or it can simply be a mixed bag (eg Liberte). BKN is a much more complex game compared to some of the other hex-based wargames in my collection such as Afrika Korps, Battle of the Bulge, Rommel in the Desert (this is not hex based anyway) so I thought it would be good to have a mix bag. Another important factor is this game is based on the very good area-impulse movement mechanic first made popular in Storm over Arnhem. MMP has reprinted some of the Storm Over series and even incorporated the mechanic into a few new Storm Over series but have been getting mixed reviews on them so I’ve not pulled anything there yet. Will be watching that closely no doubt. Another OOP (card) game that’s fun to play! Np picture or game box cover for this game. Go and oogle for it if you want to see how it looks like. tsk tsk. Scrabble with a twist? Hah… in this word-forming game, you have to first “buy” your tiles before you can use them to form words which you hope to sell at a price higher than what you bought those letters for. Teaches money management as well as word building skills. 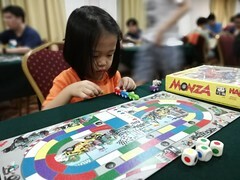 A Boardgamekids favorite. And no rhyen, you cannot form words that we cannot pronounce hehehe. Wrong game. I heard they are planning a reprint of this game in Deluxe edition for this year. Worth watching out for it. No other info on this Deluxe edition except a possible box cover image that I got from BGG (above). That’s it! A rather short list for “B” games. I know “C” is another killer list (whew) but let’s take a look at a couple of notable mentions for “B” gamese that I do not yet own. A board version of the (then) popular BLUE MOON (OOP) card game, I’d played this once when lostboyz (datuk) brought his copy to our meetup. Since then, I’ve seldom seen this game but the first play gave me a pretty good impression of the game. Another gangster themed game (hmm…. games of same theme tends to stay together in the same list? ), this game also sets you in the era of Prohibition. I didn’t get a chance to play this so can’t comment how the game works. Hoping to get either a play session or the chance to buy this game at a good price. Seen any fave of yours? Ask to play them at the new OTK Cheras. Discuss here. 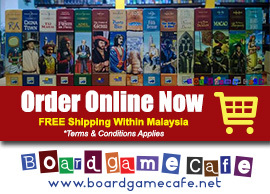 Check out the list of “B” games as available from our webstore. 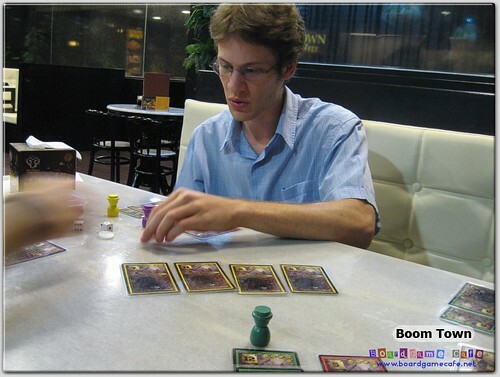 One of the trio who sits on the Council of Boardgamecafe.net and a boardgamer by choice ever since he saved up for his own copy of Monopoly donkey years ago, and fell in love again when he got re-acquainted with Acquire. To get around the question of why he needs to buy so many games, he told his wife they are going into the boardgame business. Well, he did step into the boardgame business so try not to believe every single word he writes here as he’ll also try to sell you the games! When not doing anything with boardgames, CK hits the road running 10K races and hopefully would make a return to squash soon. Wow, lots of B’s on your list. I’m glad you mentioned Blokus. I also really want to try out Battlestar Galactica. I think the cylon/traitor aspect would be interesting. For party games, I would also have to recommend Balderdash, one of my favourites of that genre. Ian, you definitely shud check out BSG. It’s one of the best coop games!